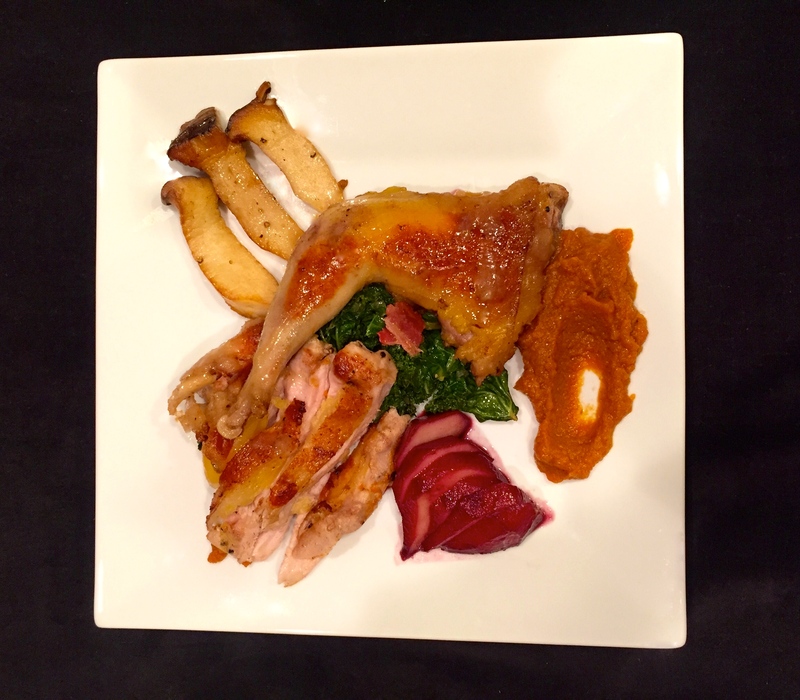 I’ve finally discovered how I can make the most juicy, and tender pheasant… with a Sous Vide Supreme water oven. Once the pheasant are prepped and vacuum sealed, the water oven does all the hard work. While this dish has many components and may look intimidating, the steps are quite easy, and most can be done 24 hours ahead. Don’t shy away from this one… you’ll love it and it’s perfect for fall! If you don’t have a water oven or immersion circulator, don’t worry, I’ll give instructions on using a braising method, titled “Braised Pheasant with Red Wine Poached Seckel Pears”. I've finally discovered how I can make the most juicy, and tender pheasant... with a Sous Vide Supreme water oven. Once the pheasant are prepped and vacuum sealed, the water oven does all the hard work. While this dish has many components and may look intimidating, the steps are quite easy, and most can be done 24 hours ahead. Don't shy away from this one... you'll love it and it's perfect for fall! If you don't have a water oven or immersion circulator, don't worry, I'll give instructions on using a braising method, titled "Braised Pheasant with Red Wine Poached Seckel Pears"
To keep the pheasant skin from shrinking, tie each piece with kitchen twine to keep the skin in tact, making two loops around each piece and tie in a knot. Make a dry rub of the garlic powder, onion powder, pumpkin pie spice, celery seed, salt and pepper. Rub the pheasant pieces with the dry rub and add any extra dry rub to the vacuum bag. Separate the pheasant, with the breasts in one bag and the leg quarters in another. Roughly chop all carrot, onion, celery, and garlic and divide between both bags. To each bag add a bay leaf, the thyme divided into each, 3 tablespoons butter, 4 chicken stock ice cubes in each bag. Vacuum seal both bags, and refrigerate, overnight. Heat the Sous Vide Supreme to 85ºC/185ºF. Peel the pumpkin, split it down the middle, and scoop out the seeds. Cut the pumpkin into 1 inch cubes for about 2 cups. Add the pumpkin and remaining ingredients to the vacuum bag and seal. Place in the water bath for 1 hour, or until tender. Pour the contents of the bag into a blender or vita mix, **caution when blending hot ingredients, start out on low speed. Pulse the blender, or vita mix until a smooth puree is achieved (if the puree is a little thick, add 1/4 cup heavy cream). Reserve puree in the fridge, in a lidded container, overnight and re-heat before serving. 24 hours ahead. This is a great use for the pheasant scraps, but not necessary for the dish. Rough chop the carrot, celery, shallot, and set aside. Season the pheasant scraps with salt and pepper. Add a few tablespoons canola oil to a large sauté pan over medium high heat. Add the pheasant scraps and brown on both sides. Add the vegetables, and sauté for 2 minutes. Add all the remaining ingredients and simmer to reduce, or place in a 350ºF oven for 40 minutes. After the stock has reduced and concentrated, strain out all the solids and discard, and reserve the stock for the pheasant. This can be refrigerated, in a lidded container, overnight and re-heated for serving. Add all the ingredients except the pears in a small stock pot and heat to a gentle simmer until the liquid is reduced by half and syrupy, about 10 minutes. Add 2 halves to each jelly jar and divide the red wine syrup between the two jars. Seal the jars with lids and rings and place in the Sous Vide Supreme for the last 1 hour and 15 minutes with the pheasant legs at 63ºC/145ºF. While the pheasant is being finished leave the pears in the jars on the counter to cool slightly. Place the pheasant leg quarters in the Sous Vide Supreme and set the temperature to 63ºC/145ºF. Set the timer for 11 hours. Once the timer goes off, add the bag of pheasant breasts and set the timer for 3 hours. Once the timer goes off, add the jars of Seckel pears. Set the timer again for 1 hour. Once the timer goes off (total of 15 hours), remove the bags and jelly jars. Remove the pheasant pieces, and strain out the liquid, discard the solids, reserve the liquid. Pat the pheasant pieces dry, leave the strings in tact. Heat a large frying pan with oil and quickly sear the pheasant pieces a few at a time, until both sides are browned. Set the pieces aside, and deglaze the pan with the reserved juices, and add the pheasant stock (if prepared). Heat on high to reduce quickly. Remove the kitchen twine from the pheasant. Re-heat the pumpkin in the microwave for about 2 minutes. Serve the pheasant with some pheasant sauce over top, pumpkin puree, and sliced pear and some red wine syrup. **If and immersion circulator, or water oven is not available, I will add a recipe that is similar that uses a braising technique: See "Braised Pheasant with Red Wine Poached Pear."